After completing the body and lid, it’s time to craft the final piece of your keepsake box: the feet! For this project, we recommend choosing from a standard or scrolled Ogee Bracket foot. And instructions for both are included in this final post. The Ogee Bracket Foot Bit (#175-1105) allows for adjustment in height to give variations of the same profile. The different variations depend on the height of your stock. In this case, we left an extra ¼” above the top of the foot profile. This will allow the foot to fit inside the remaining 1/8” of the rabbet cut previously made on the underside of the body’s plywood bottom. To begin, determine the required foot dimensions (height and length). *Tip: To make handling the smaller pieces easier, one or two long pieces can be used and cut to the finished length after they have had the profile routed on them. Next, set up and cut the Ogee Bracket Foot Molding profile. Use the bit with a feather board to keep pressure against the fence. Finally, cut the stock to your required lengths. *Tip: Ensure these will fit the rabbet on the underside of the box’s body for the front, back, and sides. Also include a 45° miter on the inside where they will meet at the corners. This will make a solid enclosed base. 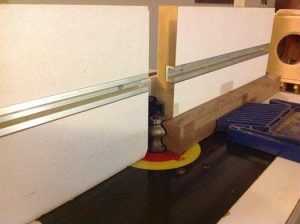 Four separate pieces were run through the router table, just as shown above. This was done because the feet at the desired length would have been too short to safely work with. *Tip: Working with longer lengths of stock makes the next steps easier and much safer. With the profile cut on the front edge, transfer the profile onto both sides of all 4 pieces. *Tip: This will leave you with 8 halves of 4 feet (right and left sides). 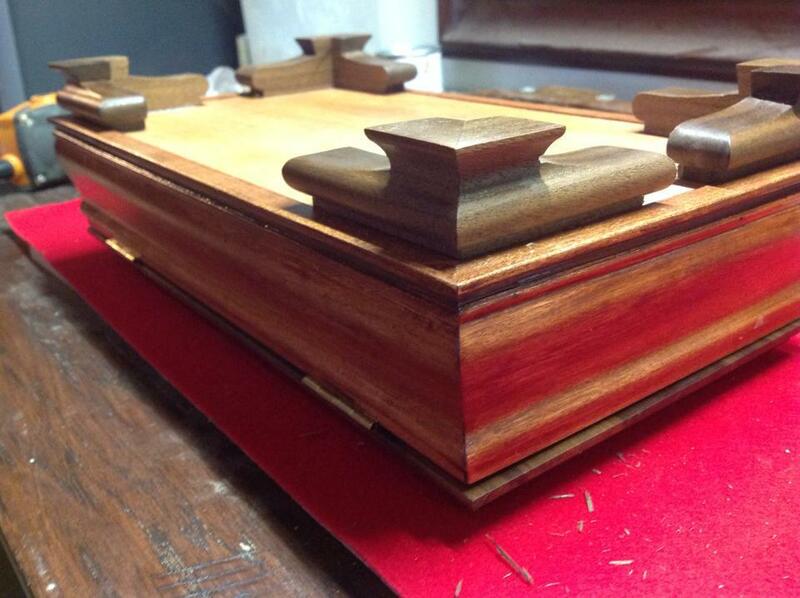 Now take these four arched and beaded lengths and miter the left and right sides of the feet. *Tip: When you glue and match them up, you can use masking tape to hold them together. Sand, stain, and apply a finish to the feet. Then the feet should be glued and fitted into the corners of the box body. Let set until glue is dry.